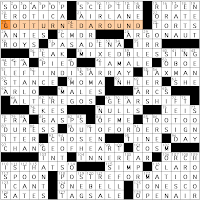 If you haven't done Caleb Madison's Bard Bulletin crossword in Across Lite (posted at the Crossword Fiend forum), now you can also solve it online at the Bard High School Early College's student paper site. Patrick Merrell's New York Times crossword, "Career Day Speaker Schedule"
Did you know that Patrick Merrell has two blogs? 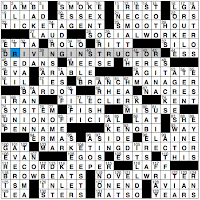 At Pat Tricks, where he writes on an occasional basis, his latest post features a cartoon in honor of Will Shortz's 16th anniversary as the New York Times crossword editor. (Congrats, Will! And no, we're not giving you a convertible for your sweet sixteen.) Pat writes more regularly at the NYT's Wordplay blog, where he alternates weeks with Jim Horne now. Hey, look! Patrick blogs his own puzzle today. He mentions that many of his past puzzles have been one-of-a-kind innovations, but that this one is more ordinary. Indeed it is. The theme didn't especially grab me, but there were some shining stars in the fill and clues. First, the theme. The clues are playful redefinitions of various job titles. For example, a DRIVING INSTRUCTOR might be thought to be a good label for 38A: Career Day Speaker [#3: Golf pro?]. At 70A, the FILE CLERK is billed as a [#5: Manicurist?] on the Career Day schedule. 111A: [#8 Disc jockey?] is billed as a RECORD KEEPER. Who was responsible for all these misconstrued job titles? You might say that the 119A: [Career of the parent who typed up the Career Day schedule?] is a NOVEL WRITER, in that...he or she writes things in a novel manner? That doesn't feel quite as apt as I'd like a theme's capstone to be. • 19A. [Literary work in which Paris is featured] is the ILIAD. Paris, the Trojan, not Paris, the city in France. • 68A. IRAN is the [First landfall north of Oman]. If you have a good sense of what the first landfalls are in various directions from various countries, try this Sporcle quiz. • 90A. An author's PEN NAME is one sort of [Literary creation]. • 118A. BROWBEATS means [Bullies]. Is the bully beating you with her brow or beating your brow? • 126A. A [Bay, for one] is a type of INLET. My son's been toiling all day, drawing pictures of geographical terms including bay and inlet (and dune, isthmus, glacier, coastal plain, marsh...38 terms in all). His picture dictionary is due Monday and it will damn near kill the entire household to get it finished by Sunday night. But it's a cool project, and one he's had three weeks to work on. Hmm, fondness for procrastination? I'm sure I couldn't tell you where he gets that from. • 17D. GRUELS are [Meager bowlfuls]. Even a giant bowlful is meager, no? • 30D. 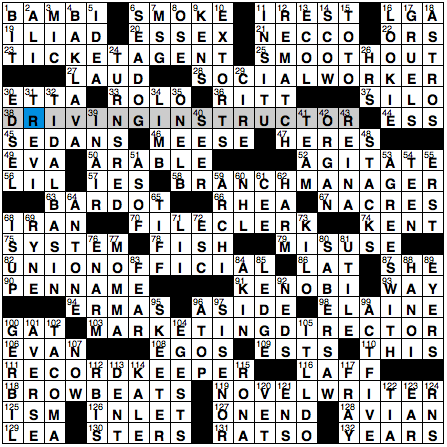 Fresh clue for EDSEL: [It debuted on "E Day"]. • 55D. ERST is boring crossword fill in English (archaic word, portion of "erstwhile), but if you know German, it's a common word: [First, in Frankfurt]. • 99D. ACTI, ACTII, ACTIII, ACTIV, and ACTV are entries that don't thrill me. ACT FIVE, however, seems cooler. Why is that? It's [When Juliet says "O happy dagger!"]. • 123D. The EAR is a [Human body part with vestigial muscles]. Holy anatomy, Batman! Can this be true? Wikipedia clarifies: They're the muscles that some people can use to wiggle their ears. I am a non-wiggler, but my son can do it. • 124D. [Hosp. V.I.P. 's] clues R.N.'S. Yay! If hospitals didn't have nurses on staff, the patients would not do too well at all. This clue is a lovely nod to the nursing profession's importance. Entries that aren't highlights, but that may be found at a fabric store: CIRE is a 29D: [Glazed fabric] and NACRES are 67A: [Button materials]. The latter is solid old crosswordese, but CIRE is markedly less familiar to me. 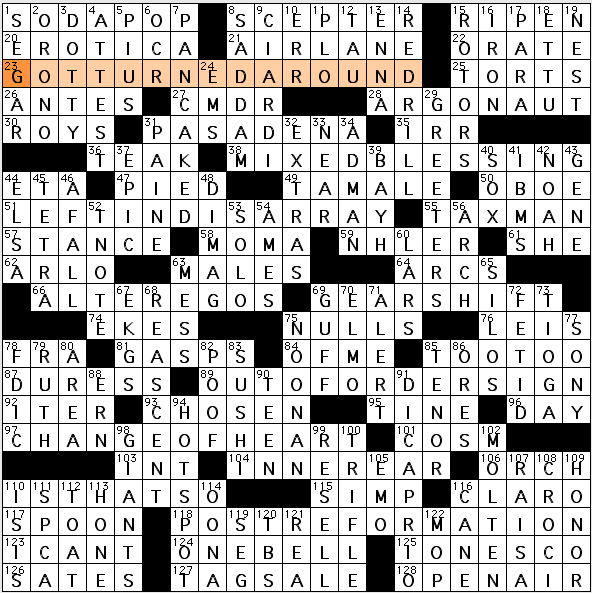 While the theme didn't wow me, I'm delighted by Patrick's return to the NYT puzzle page. His creativity and humor have led to many memorable puzzles over the years, and I look forward to seeing more of his twists on the conventions of crossword puzzles. Merl Reagle's syndicated crossword, "Mr. H and Mr. L"
• 20A. THE SCREWTAPE LETTERS is a ["Devilish" work by Mr. L]. Don't know it. • 39A. BRAVE NEW WORLD, which I read in high-school English, is the [Classic work by Mr. H]. This was the only Mr. H clue that told me H = Huxley. • 43A. [Space novel by Mr. L] is PERELANDRA. This is only very faintly familiar. • 48A. [Mr. H co-wrote a few, including "Jane Eyre"] clues FILM SCRIPTS. Who knew? • 65A. This one was my only L = Lewis clue. THE CHRONICLES OF NARNIA is a [Seven-book series by Mr. L]. • 80A. SHADOWLANDS is a [Film starring Anthony Hopkins as Mr. L]. Really? Didn't know that. Haven't seen the movie. • 89A. SGT. PEPPER'S is the [Classic album featuring Mr. H on its cover (and lots of other folks, too)]. • 92A. HEAVEN AND HELL is a [Philosophical work by Mr. H]. Don't know this one, either. • 107A. The rationale for the theme is explained here. [Interesting factoid about Mr. H and Mr. L] is that BOTH DIED ON NOV. 22, 1963. • 106D. [Rockets deployed in Germany's second wave of missile attacks in WWII] are V-2'S. 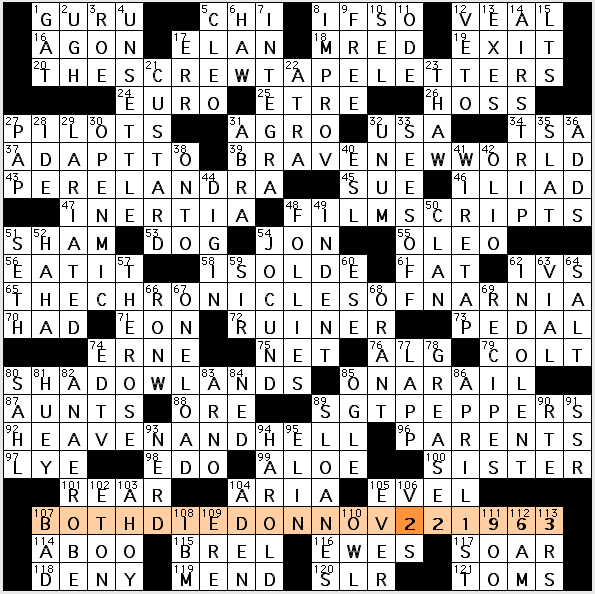 I would not have guessed the 2 if not for the November 22 date that appears with the puzzle's title. • 78D. GREASE 2 is the [1982 sequel to a high school musical]. Whatever happened to Maxwell Caulfield? • 86D. APRIL 1ST is the [Fool's day]. • 111D. The [Three-digit number denoting a charge call (as for puzzle answers] is 900. Except that the zeroes are letter Os in 117A and 121A, so in Across Lite, 9OO works. • 112D. [Time that's exactly halfway between midnight and noon] is 6 A.M.
• 113D. [Elementary school basics] are the 3 R'S. Favorite clue: [They tell you how to fix things] for RECIPES. I'm planning to make pecan pie for Thanksgiving. Want the recipe? Follow the one on a bottle of Karo dark corn syrup, only use at least double the amount of pecans so you have pecans throughout the pie rather than floating atop goo. I haven't decided if I want to make a butter crust from scratch or buy frozen crust. Weirdest answer: 29D is LARIATED, clued as [Lassoed]. Is lariat a verb, or just a noun? The Dictionary of American Regional English, or DARE, says it's also a verb. I do prefer it when Merl's themes have a lot of humor built in, which this one does not. Next week's probably will, but I'm not sure when I'll get to it—the pies and I will be out of town, and an all-star team of guest bloggers will hold down the fort here. 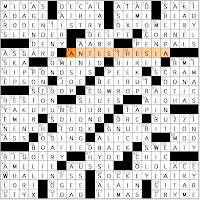 Ken Bessette's syndicated Los Angeles Times crossword, "Literal Translations"
• 23A. [TOG?] is GOT TURNED AROUND. • 38A. [GLIBNESS?] is MIXED BLESSING. This entry reminds me of a 4/8/07 NYT puzzle by Byron Walden in which the entry BLESSING IN DISGUISE was linked to both GLIBNESS and B SINGLES. • 51A. [FELT?] clues LEFT IN DISARRAY. LEFT could also be used to clue FELT CONFUSED. • 66A. [GOES?] is ALTER EGOS. This one's a bit weaker because the word EGOS is alterED. With a different letter count, ALTERED STATE could be paired with TASTE. • 69A. [RAGE?] is a GEAR SHIFT of a sort. • 89A. An OUT-OF-ORDER SIGN is [SING?]. • 97A. [EARTH?] clues CHANGE OF HEART. • 118A. [STOP?] evokes the POST-REFORMATION era. • 28A. An ARGONAUT is [One of Jason's men]. • 55A. "TAXMAN" is a [Song on the Beatles' "Revolver" album]. • 104A. The INNER EAR is a [Canal locale]. • 110A. "IS THAT SO?" sounds like a challenge, as does ["Says who?"]. • 2D. Hey! Not the usual ORONO clue. [Maine town named for a Penobscot chief]. • 16D. I misinterpreted [Curling gadget] as referring to the sport of curling and figured IRON was just a term I didn't know. Whoops. Curling IRON, used to curl hair. • 91D. Leonardo DI CAPRIO is the ["Catch Me If You Can" star]. I meant to see that movie. 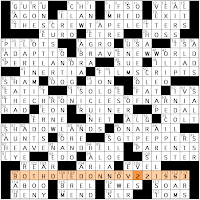 46D's clue is [Riding for ___: acting overconfidently], for A FALL. I feel as though "heading for a fall" is the more familiar phrase, but "ride for a fall"/"be riding for a fall" has more solid dictionary support. Less desirable are 68D: REASCENT, or [Second time to the top], and 14D: REDRILL, or [Put through one's paces again]. (RESELL is A-OK, though.) Is it just me, or does New York have more than its share of 5-letter towns with 3 vowels? 73D: TIOGA is a [New York town on the Susquehanna], and then there's UTICA and...maybe there are just the two. Who is this 114D: [Disney duck princess] named OONA? This cavewoman duck princess (yes, that's right: a cavewoman duck) is possibly not known to more than a teeny fraction of Americans: Wikipedia says "The adventures of Princess Oona have appeared in Disney publications in many countries including Sweden, Denmark, Norway, Finland, Germany, France, Italy, the Netherlands, Hungary, Brazil, and Russia." Had you ever heard of Princess Oona? 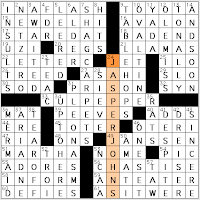 Tony Orbach's CrosSynergy/Washington Post "Sunday Challenge"
This is a terrific themeless crossword. Zesty fill, fun clues, minimal junk. Let's take a stroll through the grid. • 1A is IN A FLASH, or [Pronto]. • 18A. There's also the BAD END [A villain might come to...]. • 14D is AND SO ON, or [Et cetera]. • 34D, the [Words said with an exasperated flourish], clues "UP TO HERE." This one feels like an 8-letter partial, though, doesn't it? Does anyone say it in isolation, along the lines of a Honeymooners "Straight to the moon!"? • 7D: SHAG CARPETS are [Lush, plush furnishings], which is not to say furniture. • I like the zippy TABLE-HOPS at 9D, or [Makes the rounds at a restaurant]. • 10D is OVALTINE, the [Malt drink pitched by Joe Namath], and yes, I was thinking malt liquor. 'Tis the season to watch A Christmas Story and see the kid disgusted by the naked mercenariness of the Ovaltine people. • 24D: JASPER JOHNS, the ["Numbers" abstract expressionist artist], works two Js in to the grid. • 31D. I'm fond of PLEONASMS, which means [Redundancies], because it's a spoonerism of neoplasm. "Tuna fish" and "safe haven" are neoplasms—is there a tuna that's not a fish, or an unsafe haven? • 59A. A [Termite's terminus?] might be the ANTEATER that scarfs it up. • 5D. Good clue for LEERED: [Didn't make proper eye contact] but was instead most improper. • 9A. TOYOTA is the [Tundra producer]. • 31A. [The time there might be five to ten] clues prison. Not "five minutes to 10," but "five to 10 years." • 28D. [An addled brain might be likened to one] clues SIEVE. Answer for which I needed all the crossings: 23D: [Producer of early multi-track recorders] is TEAC. I've seen the brand name before, but the clue wasn't summoning up that answer in my SIEVE of a mind. Cute shout-out: 51A is MARTHA ["___ My Dear" (Beatles song)]. Three guesses what Tony's wife is named. 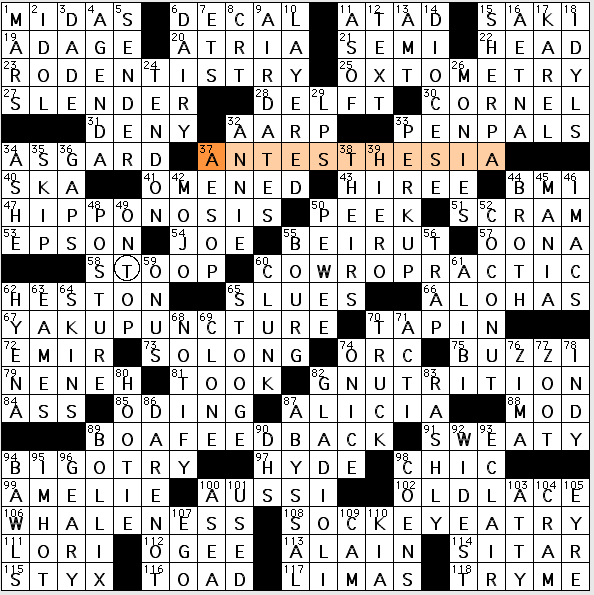 Emily Cox and Henry Rathvon's Boston Globe crossword, "Animal Quackery"
The theme is rough puns on health-care specialties with animal names affixed at the beginning. For example, RODENTISTRY is clued as a [Branch of medicine for gnawers?] (rodent + dentistry). BOAFEEDBACK is [Self-help for snakes?] (boa + biofeedback). SOCKEYEATRY is a [Fishy shrink's practice?] (sockeye salmon + psychiatry]. The puns are a mixed bag of added consonants, changed consonants, vowel changes, added syllables, etc. I wasn't crazy about this theme—pun themes straddle the fine line between "ha ha" and "uh-uh." Favorite word in the grid: 89D: BOLLIX, or [Completely bungled]. OONA is here, but clued as [Mrs. Chaplin] rather than the cavewoman duck very few of us know. I suspect the grid got changed along the way but an old clue remained in error. At 58A, the answer is STOOP, but the clue is [Dive like a hawk]. Now, that sounds exactly like a clue for SWOOP. But with those theme entries above and below, the W would've been O*W*P, which doesn't look feasible at all. Hmm. Is there a swooping-like-a-hawk usage of STOOP that I'm not aware of?